The Western Plateau is covered with great deserts and large plains with regularly spaced sand ridges and rocky regions, rising from 300 to 600 m (1,000–2,000 ft) high and constituting most of the western half of the continent, it is roughly four times the size of Texas or about the size of Argentina. Much of the Western Plateau is uninhabited with the exception of the coastal regions and scattered places of local communities of Indigenous Australians. The deserts on the plateau are the spinifex dominated Great Sandy Desert, the rocky Tanami Desert, the gravel-covered Gibson Desert which has also red sand plains and some isolated salt-water lakes, and Australia's biggest desert, the Great Victoria Desert. East of the Gibson Desert lies Uluṟu-Kata Tjuṯa National Park with Australia's most famous natural icon Uluru, also known as Ayers Rock. The Central Plains also known as the Central Lowlands, consisting largely of a series of drainage basins, including the Great Artesian Basin (GAB), one of the largest artesian groundwater basins in the world. The Central Lowlands with an area of 1,751,500 sq km (676,250 sq mi) is the largest area of internal drainage in the world. The narrow fertile coastal strip along the eastern seaboard of Australia is known as the Eastern Coastal Plain, they are bordered by the Great Dividing Range in west and the South Pacific Ocean and Tasman Sea in east. The eastern highlands is also known as the Great Dividing Range. The eastern highlands consists of a complex of hills, mountain ranges, plateaus, planes, upland areas and escarpments, ranging in altitude from 300 to more than 2,100 m (1,000–7,000 ft). The complex of mountain ranges is called the East Australian Cordillera which extend along the entire length of the country's eastern seaboard (length: 3,500 km (2,175 mi)) from Cape York Peninsula in northern Queensland southward to Tasmania. Highest point is Mount Kosciuszko, located in the south eastern corner of the country. With an elevation of 2,228 m (7,310 ft) it is Australia's highest mountain. The world's largest reef system the Great Barrier Reef is situated in the Coral Sea, on the north-east coast of Australia. The UNESCO World Heritage Site contains the world's largest collection of coral reefs. The reef is composed of over 2,900 reefs and 900 islets and islands stretching for over 2,600 kilometers (1,600 mi) north-east of the continents eastern seaboard. The Great Barrier Reef covers an area of approximately 344,400 sq km (133,000 sq mi), it is the world's biggest single structure made by living organisms, and is probably the richest area in terms of faunal diversity in the world. 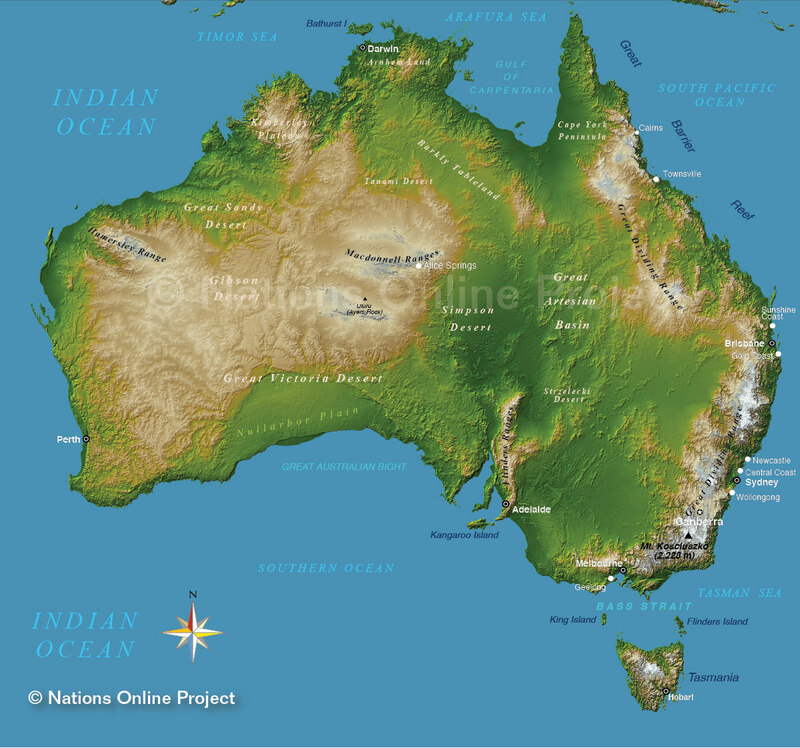 Australia's largest island (68,400 sq km (26,410 sq mi)) is situated 240 km (150 mi) south of the continent's south eastern seaboard. Australia's smallest and most mountainous state is separated from the mainland by Bass Strait. About half a million people live on Australia's favourite vacation island. The Commonwealth of Australia is a union of six states and various territories (abbreviation in parenthesis). New South Wales (NSW), capital: Sydney; Northern Territory (NT), capital: Darwin; Queensland (QLD), capital: Brisbane; South Australia (SA), capital: Adelaide, Tasmania (TAS), capital: Hobart; Victoria (VIC), capital: Melbourne, and Western Australia (WA) capital: Perth.